This morning we caught intercity train 18 from Aarhus to Vejle. This train went on to Copehangen but we got off at Vejle after 45 mins. 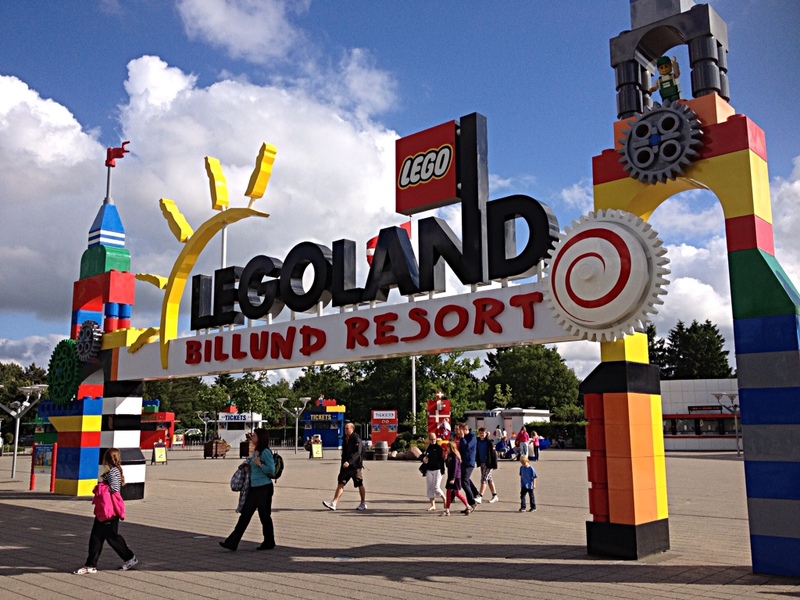 We then caught bus no 143 from Vejle train station to Billund and a stop right outside Legoland. This ride took 35 mins. So the whole journey from Aarhus to Legoland took about 1.5 hours (and about the same time returning, although a little slower because of a wait between the bus and the train). We booked our tickets at Aarhus train station yesterday and the guides helpfully gave us details of train and bus numbers and connections, as well as calculated the best train and bus times so we arrived around 10am when Legoland opened and returned to Aarhus around 8pm for a reasonable bed time. Very helpful! For Oliver and I, our all-in-one train and bus fare was 316 kroner (DK), although I think Ollie was free (up to 12 years). This is about $60 AUS. Not cheap but then I don't think much in Denmark is cheap. But the train and bus were cheaper and easier than hiring a car and driving ourselves (they drive on the “wrong” side of the road here in Denmark!!). As an aside, I suspect we've spent way too much money in Denmark because the exchange rate is tricky. 1 DK is about AUS 20 cents. And AUS $1 is 5 DK. This seems harder maths when out and about (e.g., converting 359 DK to Australian dollars) than converting pounds to dollars (I usually just multiple pounds by about 1.5, but actually that underestimates the cost in Australia dollars, so I'm clearly not doing very well budget wise). I also wasn't able to put DK onto my Travelex cash passport. I found the cash passport super helpful in London for managing our spending and didn't use my credit card much. But for Denmark, I underestimated how much DK we would need when I exchanged money at Heathrow, and so have charged more expenses to my credit card, which means extra fees. I'll be back using the cash passport when we get to the Netherlands and euros tomorrow. 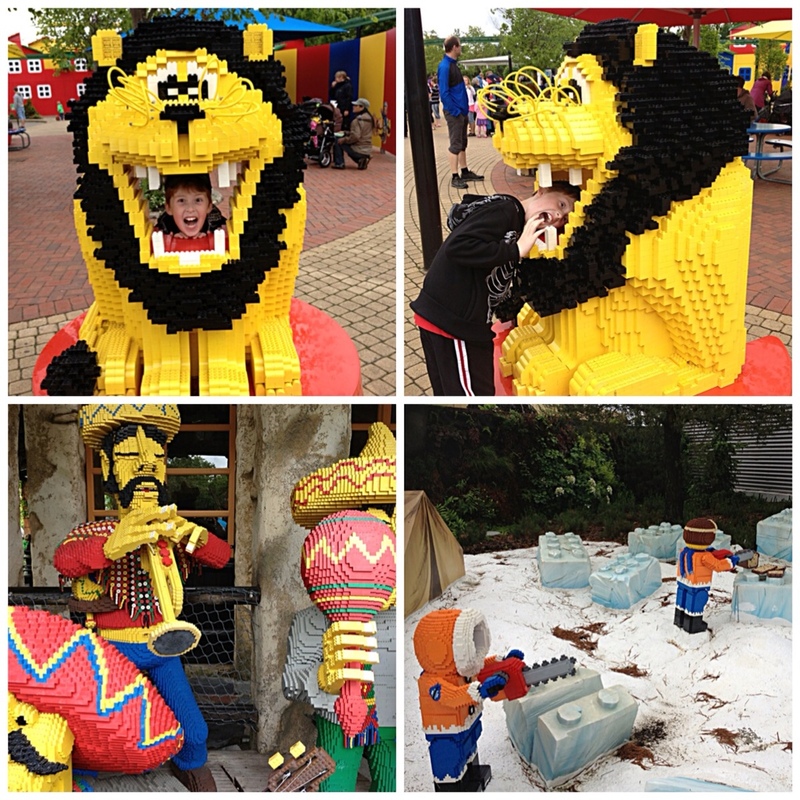 Tickets into Legoland cost 578 DK or AUS $110 for 1 adult and 1 child. I think this compares favorably with the cost of the Gold Coast theme parks. Entry into Legoland would have been 20% cheaper if we booked a week or more ahead but we didn't know which day we were going. So AUS $170 for transport and park entry. But once in, almost all rides and attractions are free (apart from two or three things we skipped). We rode lots of rides in the 6-7 hours we were there; probably 12 different rides, some a few times. The wait in line never was more than 5-10 minutes. In comparison, I read on Trip Advisor that the wait for rides at Legoland Windsor typically is 40-60+ minutes! We skipped a few rides that looked busy and I also avoided most of the rides where you get soaked. At Billund, most of the lines are under cover, which is great for the changeable weather (it showered on and off most days we were in Denmark, including our day at Legoland). And many of the areas set aside for queues are decorated with Lego displays to occupy you while waiting. 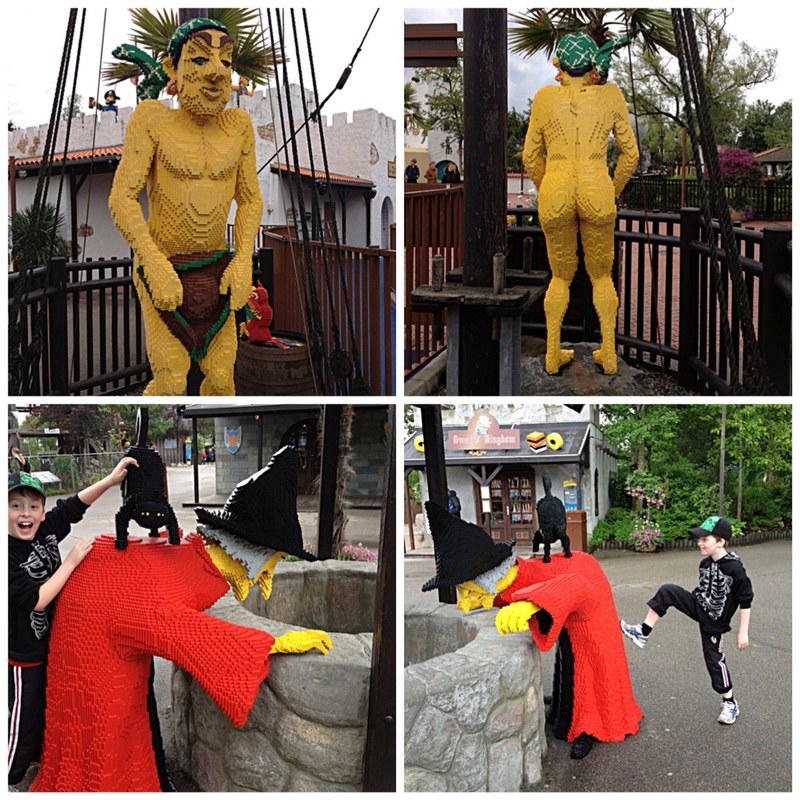 Legoland is super impressive. Apparently 60 million Lego bricks are used throughout the resort. The resort itself is immaculately clean and beautifully maintained. 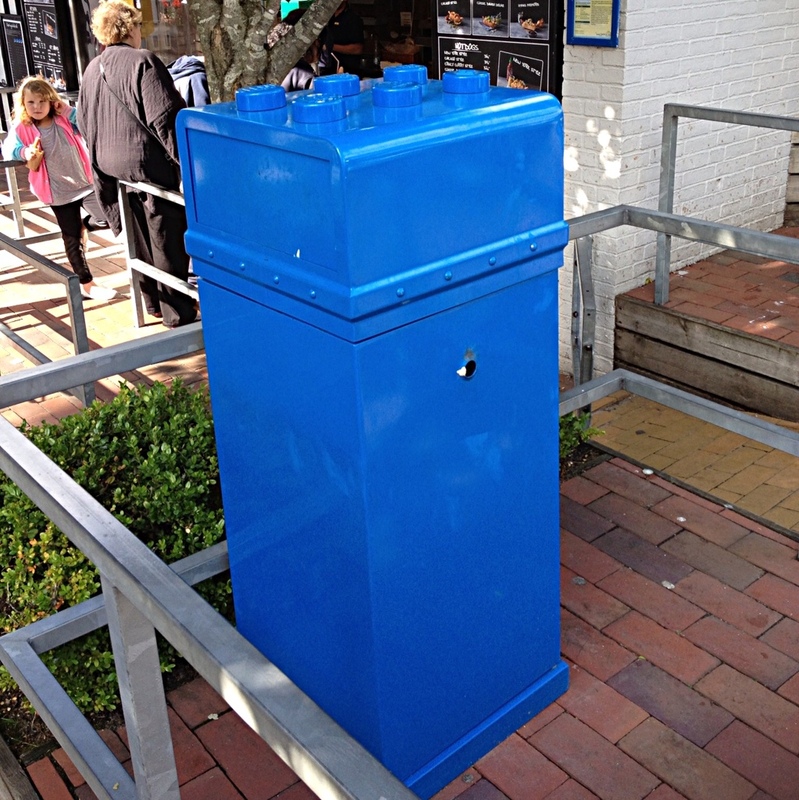 Even the garbage bins are shaped like Lego. The food is okay but very expensive, so I would recommend packing your own. 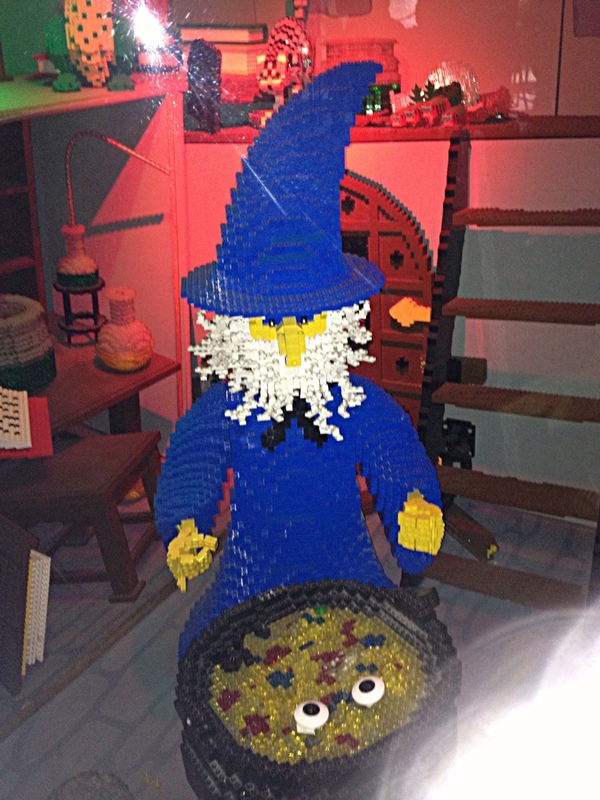 The resort is set out in themed areas, much like Seaworld or Dreamworld on the Gold Coast, but everywhere there are life size Lego figures, which make it especially charming and fun. We will post separately about the different areas, but for now, here are some photos of the figures around the park. As you'd expect, there are many, many Lego outlets throughout the park, with Lego stuff not available in Australia. We enjoyed browsing and picked up a few small things. 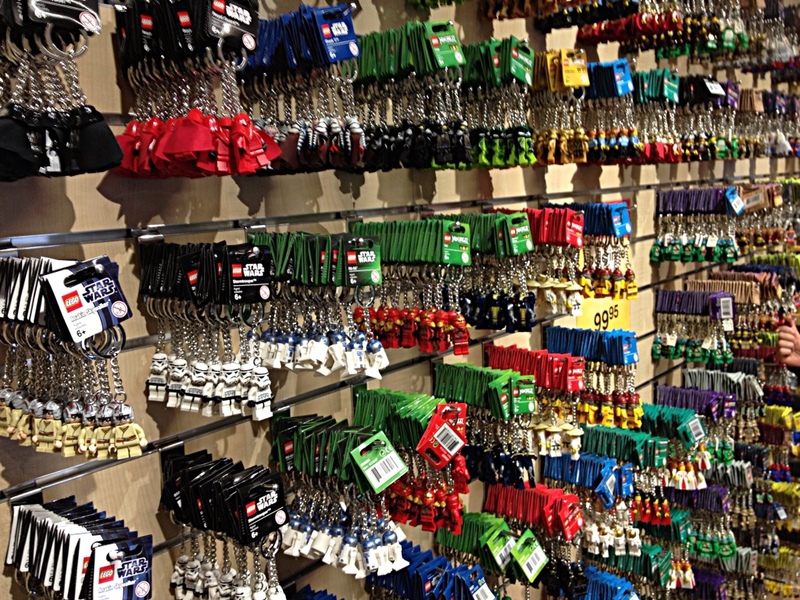 Lego mini figure key rings. 3 for 99.95 DK! In Part 2 we will write about and post pictures from different parts of the park. In Part 3 we will post pictures from Miniland, a huge highlight of our visit. And in Part 4 we will post pictures for Star Wars fans! 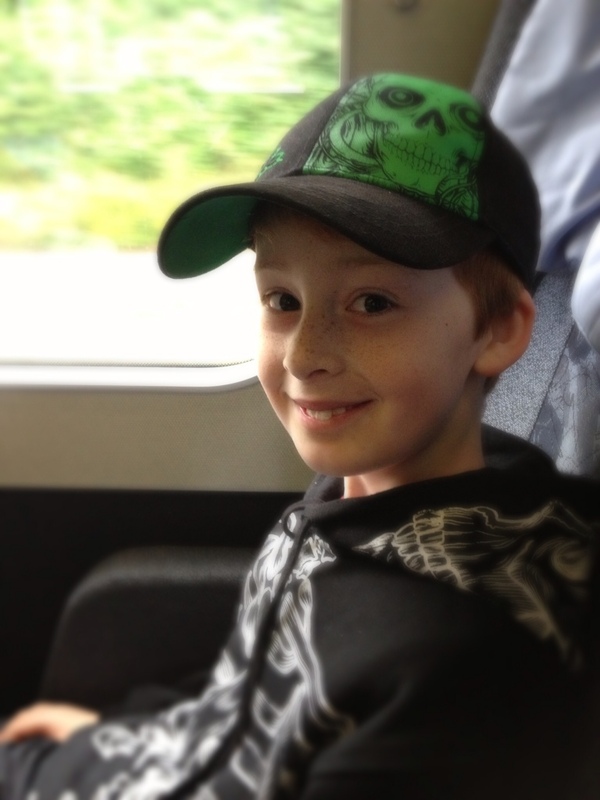 This entry was posted in Buses, In Aarhus, Legoland, Out and about, Trains on June 26, 2013 by Amanda Barnier.